South Australia’s AFL clubs have made big plays in the trade market today, with the Crows and Power both farewelling star players while stockpiling early selections in a national draft brimming with local talent. Disgruntled Adelaide forward Mitch McGovern was this morning granted his wish of a trade to Carlton – just one season after he signed a three-year deal with the Crows. 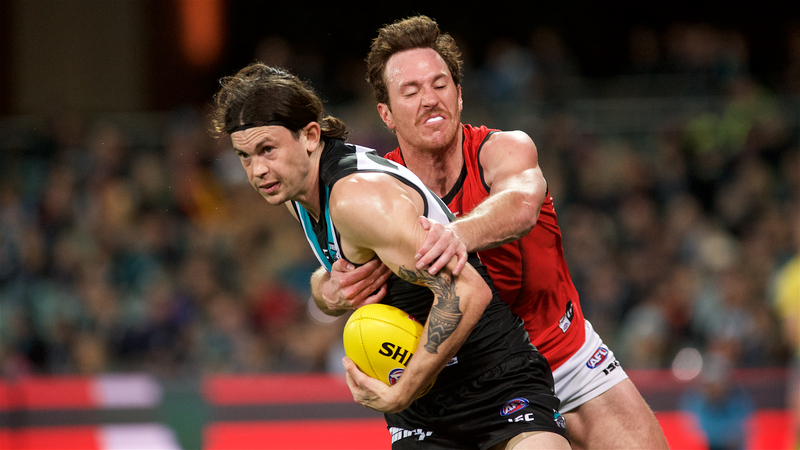 It came as Port Adelaide finalised a deal that will send line-breaking midfielder Jared Polec to North Melbourne – on a deal reportedly worth $700,000 a year over five seasons – with running defender Jasper Pittard set to join him. The twin trades mean Adelaide will farewell McGovern just a year after supporters celebrated his decision to spurn interstate interest, while 25-year-old Polec will depart Port five years after requesting a ‘go home’ trade from Brisbane to the club he grew up supporting. He was originally drafted from Woodville-West Torrens with the Lions’ pick 5 in 2010. The Sydney Swans entered the fray to facilitate McGovern’s departure from West Lakes. In a three-way trade, Carlton hand the Swans their second round draft picks (26 and 28), while the Crows send their pick 40 to Sydney. In return, Adelaide will get the Swans’ first round pick (currently 13), and highly-rated SANFL prospect Shane McAdam from Carlton, who will on-trade the 23-year-old Sturt forward after snaring him with their AFL-sanctioned priority access to mature-age state league talent. The high-flying West Australian, a nephew of former AFL player and 1989 Magarey medallist Gilbert McAdam, turned heads in his inaugural SANFL season this year, kicking 31 goals in 17 games and impressing with a mix of speed and defensive pressure. The move means he’ll be reunited at the Crows with his former Sturt coach Martin Mattner, who joined Adelaide’s coaching ranks last month. The Crows and Blues will also swap lower-rung selections in next year’s draft, with Adelaide handing over their round three pick for Carlton’s fifth-rounder. The trade appears a win for all parties, with Sydney loading up on high-value picks to bid for academy prospect Nick Blakey whose father, Kangaroos and Fitzroy star John Blakey, is the Swans’ head of development. Adelaide are expected to try and parlay a strong draft hand (the club currently holds picks 8, 13, 16, 21, 72 and 82) into a top five pick in a bid to snare a highly-rated SA prospect such as Jack Lukosius, Izak Rankine or Connor Rozee. But they will face stiff competition from their cross-town rivals, with Port handed the Kangaroos’ pick 11 for Polec and the out-of-favour Pittard, who managed just 11 games this season after finishing third in the Power’s best and fairest in 2016, when he was also an All Australian squad selection. North will also hand Port a late pick (48), with the Power handing back its fourth-round selection in next year’s draft. Port is waiting on word from star forward Chad Wingard, amid intense speculation he will request a trade to either the Western Bulldogs or Hawthorn, which would further strengthen the Power’s bid to move up the draft order. 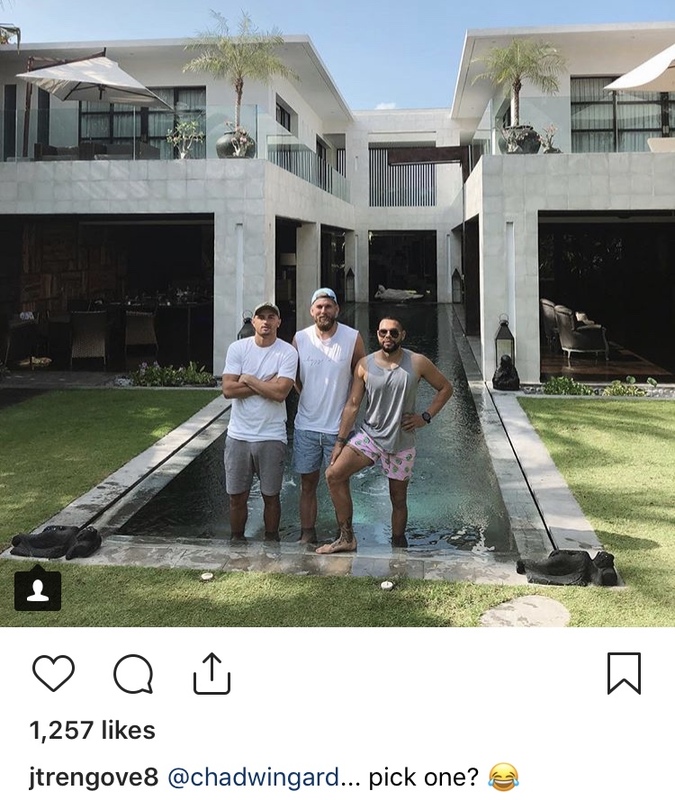 Wingard’s former Power teammate Jackson Trengove, now with the Bulldogs, makes light of trade speculation in an Instagram pic of himself holidaying with Port midfielder Sam Powell-Pepper and former Power player Jarman Impey, who is now with the Hawks. Port now hold picks 10, 11, 23, 30, 49 and 84, and are likewise expected to try and push higher up the draft order, with a mooted bid to land Brisbane’s pick 5 as part of the Lions’ pending trade for Fremantle-based South Australian Lachie Neale. Crows list manager Justin Reid noted that “the top-end talent in this year’s draft is considered to be the best in a long time”. “So to bring in pick 13, as well as a player like Shane McAdam – who we and many others in the industry rate very highly – is a great result,” Reid said in a statement. However, Reid told the NAB TradeRadio podcast today the Crows have “just got to be careful in managing expectations” around climbing the draft ranks. “It’s a possibility, we’re not ruling anything out… but at the same time it’s very rare that those top picks move,” he said. Leaving with 48 games and 67 goals at the Crows – after being selected at with pick 43 in the 2014 draft – 23-year-old McGovern will move to wooden-spooners Carlton, who are hoping to revive their list with aggressive trading and the likely addition of highly-touted Victorian midfielder Sam Walsh with their number one draft pick. However, both Carlton and the Kangaroos have failed to bag the big game they were seeking in the trade period, with GWS midfielder Dylan Shiel rejecting the Blues for Essendon, and North’s prime target Andrew Gaff opting to stay put with West Coast. But both clubs are expected to remain active during the trade period, with significant salary cap space to play with. Port’s football manager Chris Davies noted that Polec was always expected to be lured by North’s big-money offer. “Although it’s disappointing to see him go we understand the reasoning behind his decision and wish him all the best for the future,” he said in a statement.